Foundlings ~ Sicilian Town Place-names as Surnames. Sicily has nine provinces. Each province has a city, a ‘provincial seat’ that has the same name as the province. These cities are: Palermo, Trapani, Agrigento (formerly Girgenti), Caltanissetta, Enna (formerly Castrogiovanni), Messina, Catania, Siracusa, and Ragusa. My sense of the matter is that first the cities were named, and then the regions under their influence acquired the names of their major city. This often leads to confusion for genealogic researchers. An immigrant, when asked where he was born, may have responded, for example “Caltanissetta”, leaving the researcher to figure out whether he meant one of the many towns, variously named, in the Province of Caltanissetta, or whether he actually was born in the town named Caltanissetta. This puzzle is further complicated if the immigrant, responding to “Where did you come from?” answered “Palermo”, which is a seaport. Did he mean he was born in the Province or city of Palermo, or did he simply mean he 'came from' the port of Palermo, where he boarded the ship that took him to America? 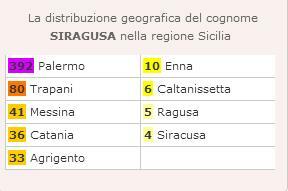 An interesting aspect of these city and provincial names is this: many Sicilians (as well as Italian mainlanders) have surnames that are the same as those of these towns and provinces, or derivations of them (Siragusa for Siracusa; Rausa for Ragusa; Girgenti for Agrigento). What does this mean? Most folks simply accept their surnames without questioning their origins. Some, with surnames like Palermo, Messina, etc., assume that their distant ancestors came from the town or province bearing that name. In my research experience, that has not always been the case. 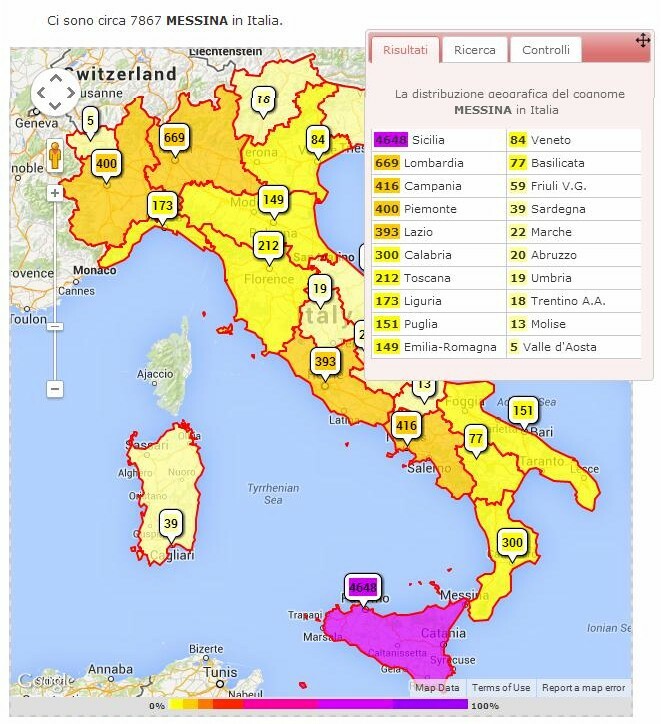 To shed some light on this naming procedure, I used the Italian website http://www.cognomix.it/mappe-dei-cognomi-italiani/. That site allows a search using any surname, and returns various “hits” including maps of Italy and Sicily like the ones below for the surname Messina, showing the modern-day distribution of surnames. I make no claims about the accuracy of the maps: the information is probably from phone, mail, or e-mail databases, and most likely does not include all persons with a particular surname. But I think the results can be reasonably compared. The tabulations are shown here, beginning with the least-common surname. 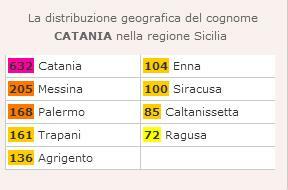 The number in parentheses after the place-name heading indicates the number of occurrences of the surname in Sicily. 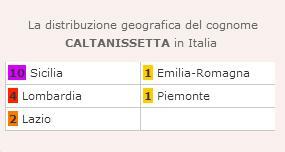 CALTANISSETTA (10): Caltanissetta appears as a surname only eighteen times in the site cognomix.it for all of Italy, including only ten in Sicily. 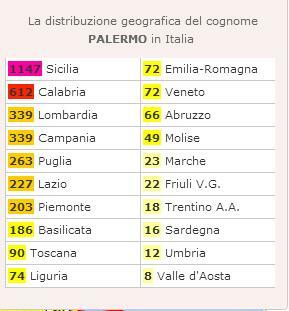 There, nine are in Palermo province and one is in Catania province, with none in Caltanissetta, nor any of the other provinces. Caltanissetta is a modification of the Arabic name Qalat al Nisaà or “Fort of Women”. ENNA (13 + 246): Enna, the city, is the oldest surviving city in Sicily, having been founded before 1100 BC by the indigenous Sicani. The ancient name was Henna, but the town was known as Castrogiovanni from the Middle Ages until 1926, when it was changed to Enna, which is also the name of its province. 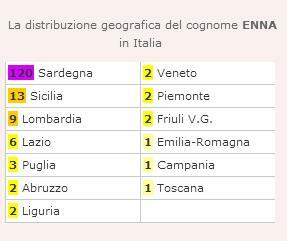 The site cognomix.it shows 164 instances of the surname Enna in all of Italy, surprisingly with 120 in Sardinia and only 13 in Sicily. 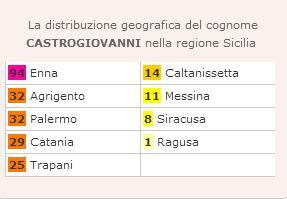 The distribution in Sicily is 11 in Palermo province, with one in Trapani province and only one in Enna province, none in the other provinces. The surname Enna is the modern pronunciation of the ancient name Henna. 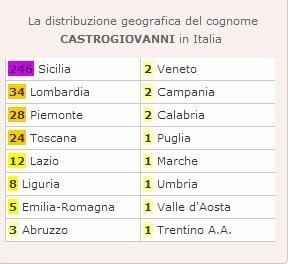 The surname Castrogiovanni occurs 471 times in all of Italy, with the preponderance (246) in Sicily, where most (94) occur in Enna province. This seems reasonable, as the greatest occurrence is in the province in which the town is located. However, as we shall see, this is the exception rather than the rule. The meaning of Castrogiovanni is “Fortification of Giovanni”. 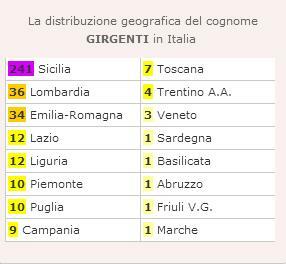 AGRIGENTO (241): There were no individuals found with this surname, however the ancient name of the town was Girgenti, and that surname appears 601 times for all of Italy, including 241 in Sicily. 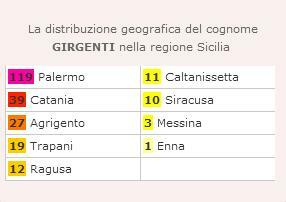 In Sicily, the greatest number, 119, occurs in Palermo province, with only 27 in Agrigento province. Agrigento and the ancient version Girgenti are derived from the name of the Greek settlement there, called Akragas. 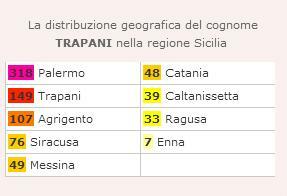 TRAPANI (826): The surname Trapani appears 1,792 times in Italy, including 826 in Sicily. 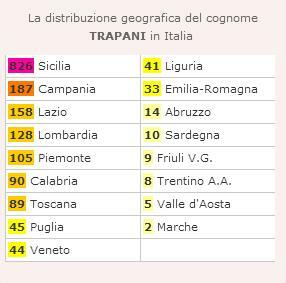 The greatest number in Sicily, 318, occurs in Palermo province, with Trapani province coming in second with 149. The surname Trapani is derived from the Greek Drépanon, which means “sickle”, from the shape of the harbor of the town of Trapani. SIRACUSA (1,059): The surname derived from this place is spelled as either Siracusa or Siragusa. They occur 1,699 times in Italy, including 1,059 in Sicily. 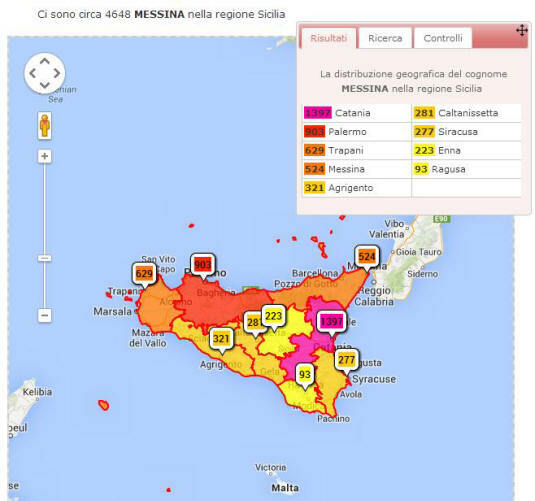 Siracusa occurs 143 times in Messina province, and only 29 in Siracusa province; while the form Siragusa has 392 occurrences in Palermo province, with only 4 in Siracusa province. 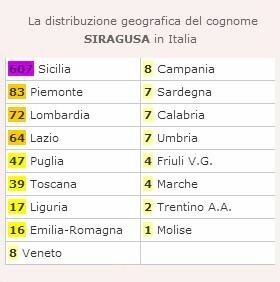 Siracusa/Siragusa is derived from the Greek syrako, meaning swamp or marsh, describing the town’s environs. PALERMO (1,147): Palermo is a very common place-name-derived surname, with 3,499 in all of Italy, with the largest representation being in Sicily with 1,147. But the greatest occurrence is not in Palermo province, but in Trapani province with 238. The provinces of Catania (219), Agrigento (174) and Caltanissetta (156) all have more than Palermo province, which has 141. Palermo is the result of successive changes in the name of the city from the Greek Panormus, meaning “complete port”, to the Arabic Bal’harm, to the present Palermo. 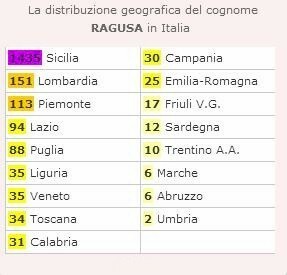 RAGUSA (1,509): The surname derived from this place name takes two forms, Ragusa and the far less common Rausa. Combined, it occurs 2,376 times in Italy overall, and 1,509 in Sicily. 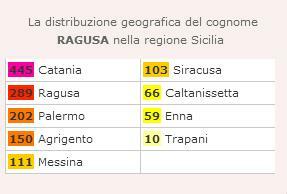 Its greatest occurrence is in Catania province, with 501, while Ragusa province is second with 290. 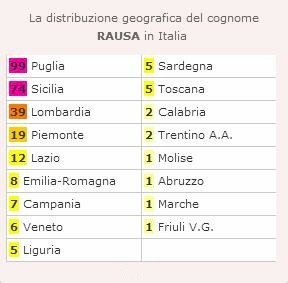 The name Ragusa is thought to derive from the Byzantine Greek word rogos, meaning ‘granary’, because of the richness of the agricultural region. CATANIA (1,663): Catania occurs as a surname 2,675 times in Italy, with 1,663 occurrences in Sicily. 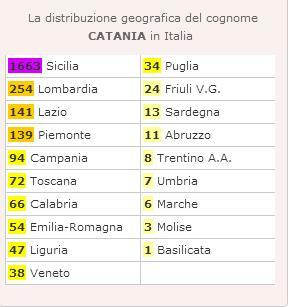 Catania province itself has the most Catania surnames in Sicily, 632, followed by the provinces of Messina (205) and Palermo (168). The surname Catania comes from the name of the ancient Greek settlement Katáne. 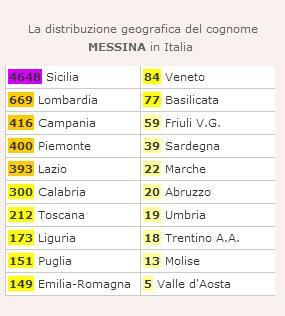 MESSINA (4,648): Messina is by far the most common place-name-derived surname, with 7,867 in all of Italy, the majority of them (4,648) in Sicily. 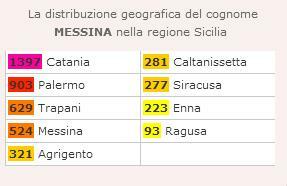 But the greatest occurrence of the surname Messina is not in Messina province, which has only 524, but in Catania province with 1,397. 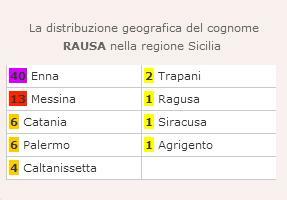 Two other provinces have more Messina surnames than does Messina province: Palermo province with 903, and Trapani province with 629. The original Greek settlement in the area was called Zancle by them, but was changed in 500 BC to Messene to honor the city in Greece by the same name. The modern name of the city, its province, and the surname, is Messina. The surname Caltanissetta occurs most in Palermo province, as do the surnames Girgenti, Trapani and Siragusa. 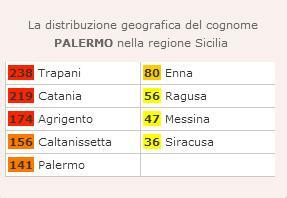 But the surname Palermo occurs most not in that province, but in Trapani province. 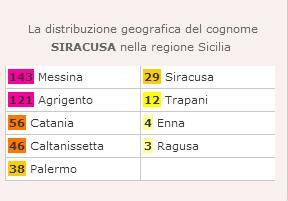 The surname Siracusa occurs most in Messina province, while the surname Messina occurs most in Catania province, as does the surname Ragusa. Of course, these are modern numbers; the distributions would have been different centuries ago, when surnames first began to be used. And today, certainly, most of these surnames may be found not only in Italy and Sicily, but in America and all over the world. 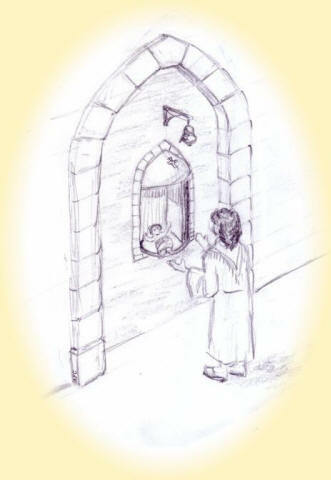 An explanation of the anomalies presented above, I believe, is that in many cases the surnames were given to foundlings, whose ancestral names were not known. For centuries, in Sicily, foundlings were given stigmatic surnames by their discoverers: Proietto (castoff), Esposto (exposed), Trovato (found), and so on. Even crueler names like Milingiana (eggplant) and Giumento (mare) were used, and townspeople knew immediately that children with those names were at best orphans, and at worst born out of wedlock. Of course, when boys with these surnames matured and married, their children took the made-up surnames as valid, legitimate names, and their sons passed them on to their descendants, most of whom have no knowledge that somewhere in their distant ancestry was an abandoned child. Eventually, laws were passed proscribing these unkind surnames, but milder ones could be just as damning: surnames like di Dio (of God), di Giugno (born in June), del Popolo (of the people), etc. In some cases, such children were given the name of the town or province they were born in, a kind of generic surname. However, more often, foundlings were given surnames derived from other, more distant towns or provinces. Hence, a foundling in Palermo might be named Messina, while one in Messina might be named Siracusa. While these names may today seem innocuous, in effect, they were as stigmatic as some of the more brusque names of previous times. The reason? Giving a child born in Palermo the surname Messina effectively labeled him or her as ‘from elsewhere’, that is, ‘a stranger’; that is, ‘a foundling’. There is some evidence for another reason for 'place names as surnames': During the Spanish Inquisition (during which Sicily was ruled by Spain), Jews were expelled from Sicily, or killed, or forced to (apparently) renounce their religion and accept Christianity. Many changed their surnames in attempts to obscure their heritage, and took names reflecting their residency: Trapani or di Trapani, Palermo, Messina, etc. Just as all 'Trapanis' are not descended from foundlings, neither are they necessarily originally of Jewish descent. It is, however, a possibility. Another possibility: The 'place name as surname' may have originally been given to an individual as an ngiuria or nickname to indicate a similarity of mannerisms, appearance, or speech to a person from that place, e. g. 'Barese' (like someone from Bari), 'Palermitano' (like someone from Palermo), and so on. Whether my theories are correct or not, whatever the origins of these ubiquitous surnames, today they’re recognized as marks of true sicilianità (Sicilian-ness); names to be proud of, echoing with memories of the homeland that sent forth daring pioneers to find a better life for their families in America. Of course, there are many other place-name derived surnames, with the names of towns other than those of provincial capitals. My experience has been that these surnames as well, generally occur outside of the province in which the town with the eponymous name lies. The surname Vallelunga, for example, occurs most often in Palermo province, not in Caltanissetta, the province of the town of Vallelunga; the town of Butera is also in Caltanissetta province, but the preponderance of Butera surnames is in Palermo and Agrigento provinces. Mistretta is a town in Messina Province, yet the surname Mistretta occurs most often in Trapani Province, and the surname Gangi occurs most in Catania Province, not in Palermo Province, which has a town named Gangi; etc., etc. Interestingly, some place-name derived surnames on the Appenine peninsula, outside of Sicily, exhibit the same anomaly. The surname Calabrese is most common in Puglia, not Calabria province, and Pugliese is more common in Calabria than in Puglia! And there are more folks named Napoli in Sicily than there are in the province of Napoli. 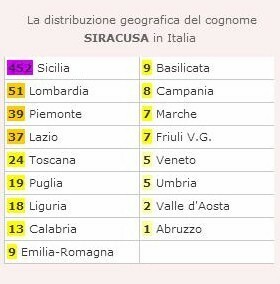 See the table below for information on a number of Sicilian place-named surnames. Viva Caltanissetta, Enna, Castrogiovanni, Girgenti, Trapani, Siracusa, Siragusa, Palermo, Ragusa, Catania, and Messina!!! 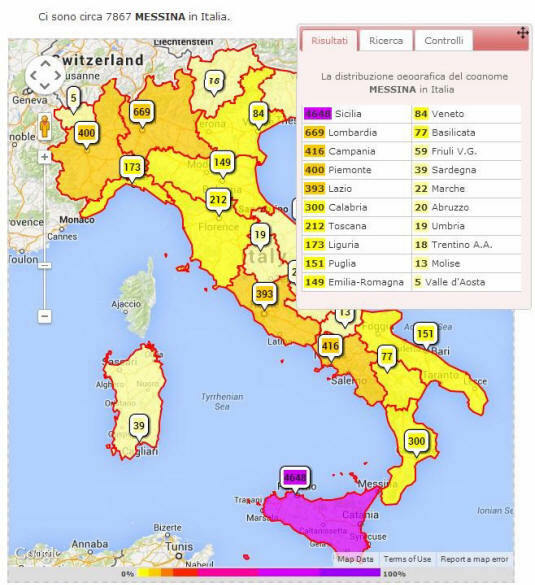 http://www.cognomix.it/mappe-dei-cognomi-italiani/ was also used for the following results. In two-thirds of the cases displayed above, the surname does not match the province where a town of the same name is located. For more about foundlings, click HERE. The Lady of the Wheel is a fictional account of events in the life of one foundling. 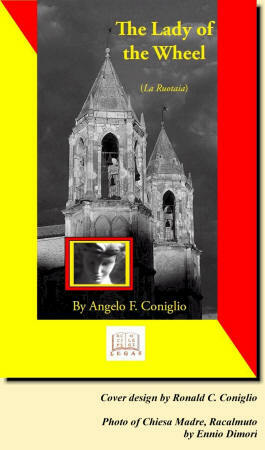 Click on the book's cover, below, for details.